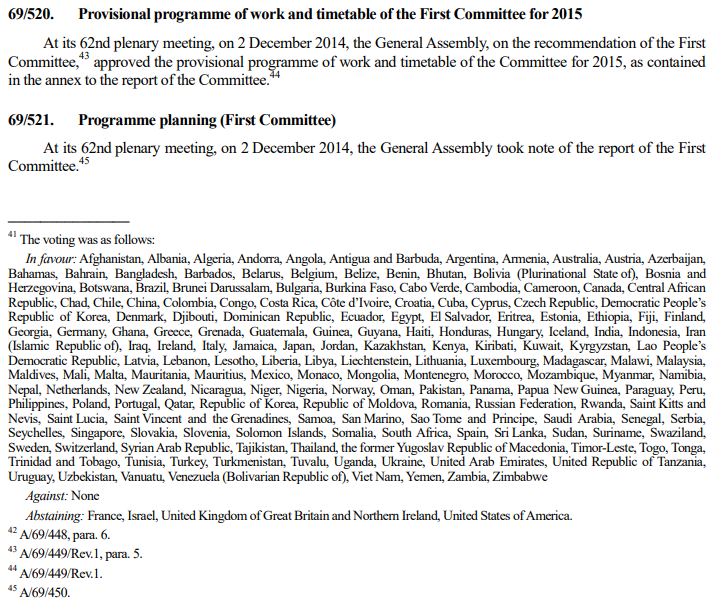 Where can I find the programme of work for the General Assembly and its main committees? - Ask DAG! Where can I find the programme of work for the General Assembly and its main committees? The programmes of work of the General Assembly and its main committees are considered under the agenda item "Revitalization of the work of the General Assembly" (link to search results from Library catalogue below). For the General Assembly plenary, the Secretary-General issues a report with the draft programme of work. The status of documentation is issued in an addendum to the report. For the committees, each committee reports to the General Assembly with a draft programme of work. The plenary considers the reports and adopts decisions on each report. The decision cites the report. For example, General Assembly decision 69/520 of 2 December 2014 (see A/69/49 (Vol. II), p. 22), approved the proposed programme of work and timetable of the First Committee for 2015, found in the report of the First Committee (A/69/946). During the session, a programme of work for plenary meetings may be issued in the A/INF/- series, for example, A/INF/72/3. Additional information is found on the websites of the General Assembly and each committee.